in 1820, Keokuk was a war chief; their main village was on a point where the Rock River flowed into the Mississippi River. It was estimated at that time, that the Sauk and Fox nations combined were 5,000 people, of whom 800 were warriors. In 1830, Stabbing Chief and Keokuk returned to Rock Island; they informed William Clark that the Sauk would be willing to see their land. 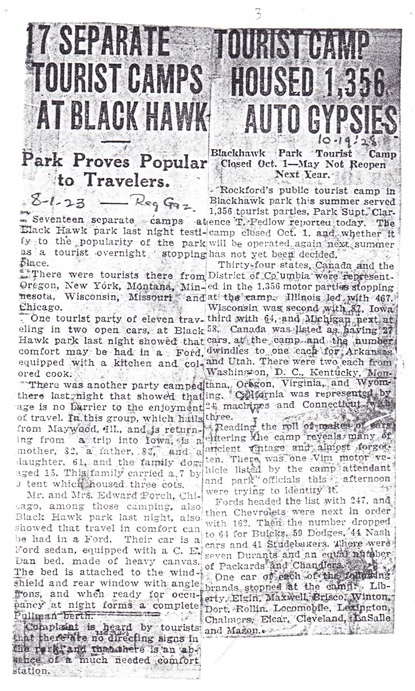 The Black Hawk War began. As a result of the Black Hawk War, the Sauk and Fox were forced out of Illinois. The portion shown shows the Rock River rising in a vertical line, and the Kishwaukee River veering toward the right, in a sometimes horizontal direction. At the bottom is Camp Grant, and at the top, Camp Fuller, which was located in the Harlem Blvd./Camp Ave./Guard St. neighborhood. An Indian, shown “above” Camp Grant identifies Indian Ancestral Mounds. A drawing of a lady in bustle holding an umbrella shows the site of Rockford Female Seminary, which became what is now Rockford University. John Brown, of Harper’s Ferry, is shown driving cattle across the Rock River. Little cabins show a small settlement called “Rib Town” located at south end of Kishwaukee St., and a grain mill shows the location of the New Mill Ford, which became New Milford. 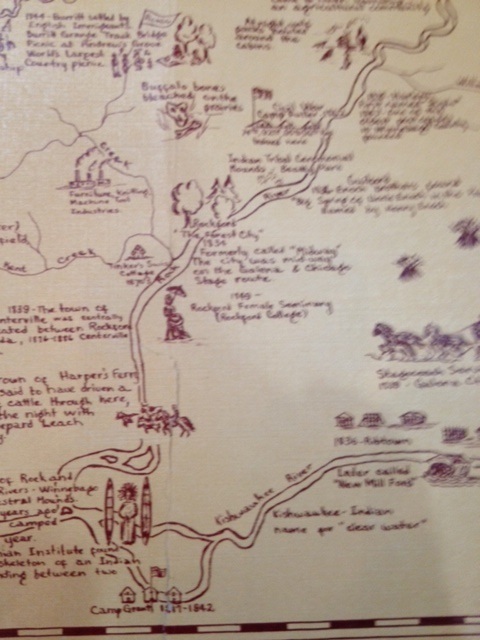 This map and many other maps and atlases are located in the Local History Room of Rockford Public Library. 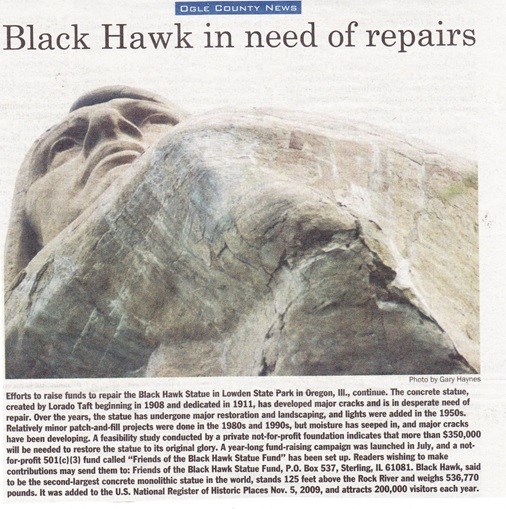 “Funds Needed for Black Hawk Statue Restoration” by Susan Johnson, copy editor. 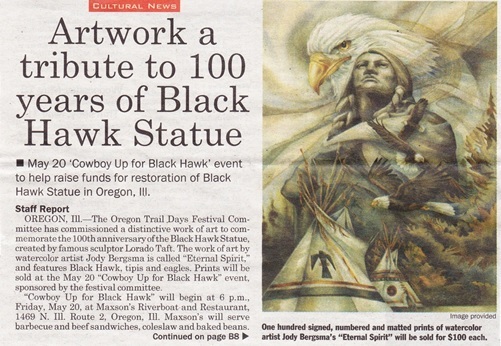 Source: Rock River Times, July 2-8, 2014, Vol. 21, No. 37, pp 8 -9. A study in art and a feat of engineering; among Taft’s most important works. Preservation advocate, Theodore W. Hild, authored nomination to National Historic Register.